NOTE: Customize this tour to include several wine tasting stops. Our Nice Private Tour With Wine Tasting Tour Includes: Our Nice private tours with wine tasting include private transportation, English speaking tour guide, taxes, tolls and parking. Not Included: Tasting costs and entrance fees to sights you decide to visit. 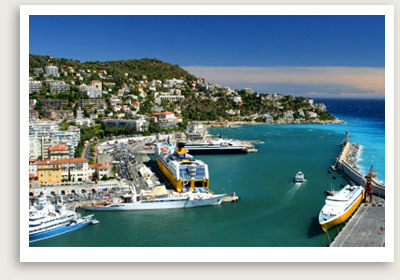 Departure points: Nice, Cannes and Monaco. Other depature points available. Languages: Guided tours of Nice available in English, Chinese – Mandarin, Russian, Portuguese, Dutch. This Nice private tour provides a great overview of this elegant and historic city and all it has to offer. You will begin with a visit to Castel Park, overlooking the Bay of Angels, with the best panoramic view of Nice. You will enjoy a visit to the ruins, gardens and waterfall here. Next you will visit Old Town, site of the trading center founded by the Greeks 2,700 years ago. Here you can visit to the colorful and fragrant flower market and stop for a Niçoise snack. Next your Nice private tour will take you downtown to Cimiez, the winter home of Queen Victoria. You will want to visit the extraordinary Russian Cathedral; built in 1912, it is the largest and most beautiful outside Russia. You will also stop at Massena Square, near Promenade des Anglais. This 1832 square is a favorite spot to relax and people-watch after a long day of sightseeing. Last but not least, you will discover a wine cellar in an old Dominican monastery right in the heart of Old Nice, the setting for your wine tasting. Here you will learn about the subtleties of the different wine regions and taste the three very best “Crus” of Provence wines.